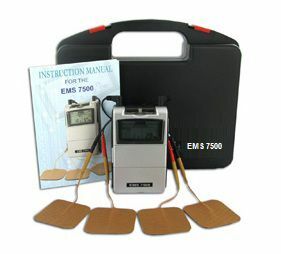 Transcutaneous Electrical Nerve Stimulation (TENS) may only be used with a physician's prescription for symptomatic relief and management of chronic pain (long-term pain which has been present for 2 weeks or more.). It may be used for the treatment of post-traumatic or acute pain (short-term pain due to recent injury or illness, the first 2 weeks). 1. Continuous Mode: Choose "N"
TENS varies thee amplitude of pulse every four seconds. 3. Burst Mode: Choose "B"
TENS produces a series of seven quick pulses followed by a rest which will pump the muscle. The cycle repeats itself twice every second. Note: Adjusting the pulse frequency has no affect in this mode. Do not use the TENS unit while driving, bathing, or in water, or over eyes, sinus, laryngeal or pharyngeal muscle which may cause contractions strong enough to close the airway. The safety of TENS during pregnancy has not been established and should only be used under the direct supervision of a physician. Be sure to clean the area where the pads are to be applied with alcohol. This insures that the pads last longer and maintain their stickiness. When applying the pads, be sure to place the pads from a common lead wire in a lengthwise orientation. Caution should be observed with the use of TENS for undiagnosed pain of unknown etiology.